Made using 100% polyester single jersey 155gsm with contrast panels made from 100% polyester mesh 145gsm, our Warriors replica training tee is lightweight and breathable, offering superior comfort while you train. 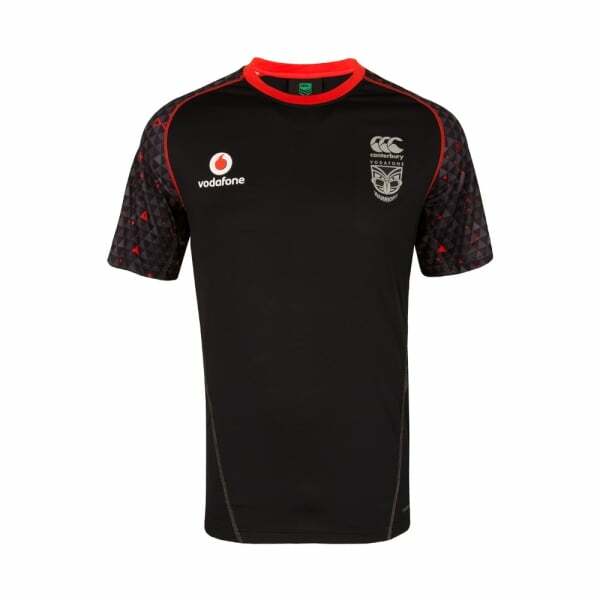 Show your support for New Zealand’s National Rugby League Team while you train in our replica training tee. With all of the design features the Warriors own training tee possesses, this training tee not only shows where your loyalty lies, but it will also help you train longer and harder. Constructed using 100% polyester single jersey with contrast panels made from 100% polyester mesh, this training tee is designed to keep you cool while you sweat it out. Canterbury’s own Vapour finish on the fabric is a moisture wicking treatment developed for next to skin applications that accelerates and enhances the transfer of vapour through the garment. So you stay dry and in complete comfort. Support New Zealand’s national heroes and up your training game is this essential replica training tee.